Lawrence Berkeley National Laboratory used infrared (IR) imaging as part of its field testing for ongoing research on the energy performance of window attachments. 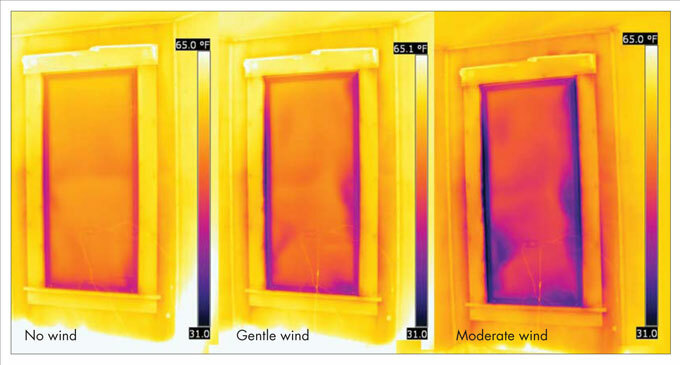 These three photos show the same window, with an interior low-e panel attached, under three different pressure conditions simulating windy weather. Even with a fairly tightly sealed interior window panel, the moderate wind level significantly increases air leakage. Note that each IR image encompasses the same temperature range—a critical detail when doing side-by-side comparisons. Let there be light, but no glare. Let there be a breeze in summer, but no winter air leaks. Let there be home security, but also quick emergency exits. In a perfect world, our windows would do all this at once. Since we don’t live in a perfect world, we have created any number of window attachments—everything from interior drapes and blinds to exterior storm windows, awnings, and roll-down metal shutters. Many attachments offer fairly low-tech solutions that allow on-the-spot comfort control and seasonal flexibility. The cost of most attachments is quite low compared with the benefits, which can include significant energy savings. Choosing and using window attachments isn’t always straightforward, though. To perform as designed, most of these attachments require proper installation and use. But once they’re installed, it is easy to ignore them, forget to use them, or deploy them in useless or counterproductive ways. That brings us to the other challenge: hard numbers on the energy performance of window attachments have been hard to come by, leaving us at the mercy of overstatements by manufacturers. With objective information on attachments scarce and key tax incentives rewarding window replacement, many windows that could be improved end up in landfills instead, and many simple window-performance problems remain unsolved or inadequately managed. In this article, we’ll walk you through a wide variety of window attachments and discuss how to get the best performance out of each type; the ten tips at the end of this article will help you make the most of this information. We’ll also take a sneak peek at ongoing research the Lawrence Berkeley National Laboratory (LBNL) is conducting on window attachments in partnership with BuildingGreen, Inc., publisher of EBN. As in our recent article on windows ( “Choosing Windows: Looking through the Options,” EBN Feb. 2011), we will focus on residential strategies—but most of the discussion applies to commercial buildings as well. Window Film: An Overlooked Retrofit Option?